➜ UPDATE: Another CIA vet weighs in ominously on Trump. Details here. In a blistering piece written for the Washington Post — with accompanying video — a CIA veteran went public with his resignation from the agency saying he could not see himself working for President Donald Trump. According to Price, he had made plans to make a career at the agency and has served under Presidents from both parties, but he said Trump presents insurmountable problems. Trump’s actions in office have been even more disturbing. His visit to CIA headquarters on his first full day in office, an overture designed to repair relations, was undone by his ego and bluster. 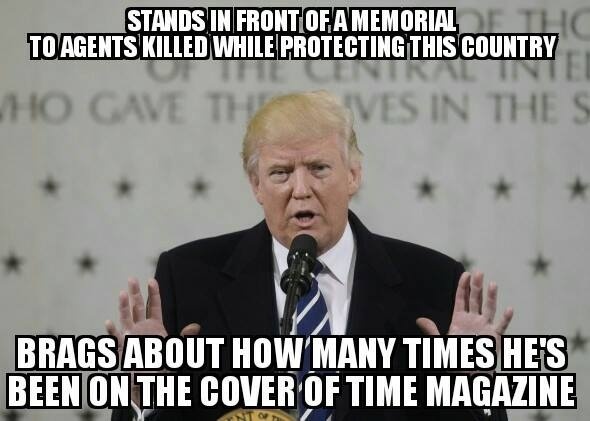 Standing in front of a memorial to the CIA’s fallen officers, he seemed to be addressing the cameras and reporters in the room, rather than the agency personnel in front of them, bragging about his inauguration crowd the previous day. Whether delusional or deceitful, these were not the remarks many of my former colleagues and I wanted to hear from our new commander in chief. I couldn’t help but reflect on the stark contrast between the bombast of the new president and the quiet dedication of a mentor — a courageous, dedicated professional — who is memorialized on that wall. I know others at CIA felt similarly. The public outcry led the administration to reverse course and name the CIA director an NSC principal, but the White House’s inclination was clear. It has little need for intelligence professionals who, in speaking truth to power, might challenge the so-called “America First” orthodoxy that sees Russia as an ally and Australia as a punching bag. That’s why the president’s trusted White House advisers, not career professionals, reportedly have final say over what intelligence reaches his desk. My uppermost respect this man who stands by his principles. One month in, and Donnie’s “fine-tuned machine” is already in need of an overhaul. It’s not just the thousands like this that the country will lose under The Punk, but who will be hired to replace them. The damage done by Bannon/Trump will be permanent and far reaching. I hope many others will speak out loud against this administration the way he did, with courage and integrity. It’s not just tRump that’s incompetent, it’s the GOP for allowing this farce to go on. I don’t understand how anyone that cares about the US can approve of or tolerate this level of incompetence. Yeah, we mustn’t forget that Viktor Frankenstein created the monster. Correct, and its getting to be a bit of a theme – blame Trump and let the Republican Party off the hook. No way – they own this axxhole and they are responsible for what he says and does. he forgot to mention that Hillary’s 3,000,000 vote POPULAR WIN was approximately 25 times more than the turn out for his installation ceremony. somehow, I just can’t picture a stupid racist LIAR trump deplorable as being a member of the agency. For one thing, they could never remember their 1 digit code for gaining entry to their office. This is the Teflon Administration. Nothing sticks. They’re the most despicable bunch of miscreants ever to reach such a level of power. With control of all three branches, they are doing whatever they want without fear of being held accountable. as long as the anti American republicans hold congress, then I would tend to agree. the possible placement of Chinese and/or DPRK missile launch platforms on leased training grounds in the northwestern parts of Mexico could make a positive statement by those nations, plus entice the anti American republicans to review their goose stepping stances however.